Tippy Toes is a tricky cat—sneaking, hiding, creeping, slinking. Over here. Over there. His house is the perfect place to tiptoe the day away, lurking behind unsuspecting birds and mice, crouching behind garden posies, and surprising a little boy with his unusual hiding spots. Die-cut pages let readers discover where Tippy Toe goes as his day unfolds, and end up revealing the most satisfying hiding place of all—a warm cozy bed! Told with simple rhymes and mischievous illustrations by award-winning creator Betsy Lewin, this is a book to curl up with and enjoy—preferably in a nice sunny spot. Betsy Lewin is the Caldecott Honor–winning illustrator of Click, Clack, Moo: Cows That Type and its sequels, Click, Clack, Surprise! ; Click, Clack, Ho, Ho, Ho; Click, Clack, Peep; Click, Clack, Boo! ; Giggle, Giggle, Quack; Duck for President; Dooby Dooby Moo; and Thump, Quack, Moo; in addition to a number of other picture books, including So, What’s It Like to Be a Cat? and Where Is Tippy Toes? She lives in Brooklyn, New York. Where Is Tippy Toes? ; written and illus. by Betsy Lewin. Tippy Toes is a big, friendly-looking orange cat, and during the day, this rhyming text explains, he’s easy to find as he gambols about his usual haunts or snores contentedly in a dresser drawer. “But nobody knows where Tippy Toes goes,” the narrator goes on to explain, “when the moon is full and the night wind blows”—nobody, that is, save the speaker, a tow-headed kid curled up in bed alongside a Tippy Toes all tucked up under lift-the-flap covers. There’s a gentle bounce to the verse that makes it suitable for both daytime and bedtime, and the touches of humor and kitty realism (Tippy Toes tracks across the blueberry pie, leaving berry-tinted pawprints in his wake) make the progression as enjoyable as the final reveal. Lewin aims for maximum closeup appeal in her amiable watercolor illustrations; colors are strong and simple, with spring greens (and cat’s-eye green) a strong presence throughout and sunny floral yellow a cheerful accomplice. 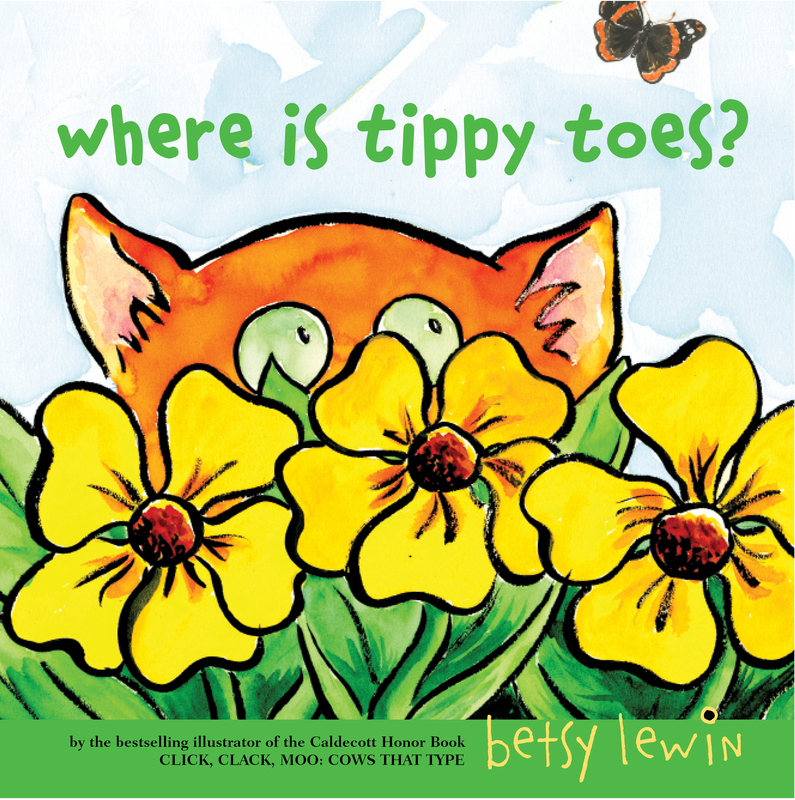 "Everyone knows where Tippy Toes is/when the sun is up and the day is his." The marmalade kitty has lots of predictable haunts, but nobody knows where he goes at night except one small person. Betsy Lewin makes the most of this simple rhyming story with big bold watercolors and die-cut pages that reveal the cat's whereabouts, whether through a mousehole, in a flower garden, or under clothes in a dresser drawer. The one person who knows where Tippy Toes goes is the child whose covers one lifts to reveal the cat sleeping in his arms. This square book with its lilting verse and amusing and endearing art will please readers and listeners alike. The sturdy, glossy pages will ensure that the book holds up to all the repeat readings that young ones are guaranteed to demand. Book Cover Image (jpg): Where Is Tippy Toes?